As my bottle of rice bran oil is almost at the end, I realized that it’s time to write my new series of posts about oils, that I’m so in love with! I was always fascinated about the Japanese culture and their beauty rituals, so I decided to try a new make-up remover: the rice bran oil, cold-pressed* of course! The results are excellent and I suggest you to try it! You can use it on every skin type for your face, body and also hair. You should also know that rice bran oil is most frequently used in cooking thanks to its beneficial properties. Try to make a difference and taste this great oil on your salads and other dishes, especially if you like mild aromas. The reason why I like the rice bran oil is its light and non-greasy texture that absorbs quickly into the skin. At the same time it makes your skin soft, moisturized and nourished. It has a light yellow color and a mild natural aroma, almost odorless. I use it as a makeup remover or body massage oil (one of the best carrier oils). Except rice bran oil for cooking, I haven’t found many options for cosmetic use. 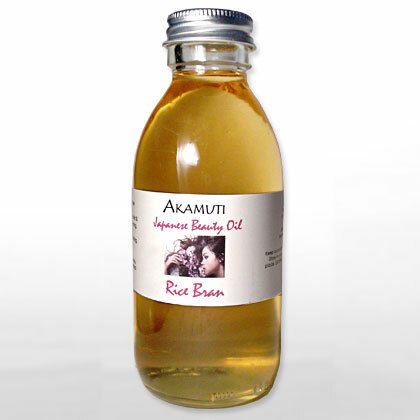 I have tried Akamuti Rice Bran Japanese Beauty Oil, which is a cold pressed oil meant to use for cosmetic purposes in a 150ml glass bottle. – Rice bran oil is used in lipsticks and finger nail polish since it holds the stick well and has a smooth spreadability. – For a long time, there has been a tradition in Japan that women rub rice bran in or put rice bran oil on their face to keep their skin smooth. These women, having smooth and shiny skin, are called “Nuka-Bijin” “Bran Beauty” in English. 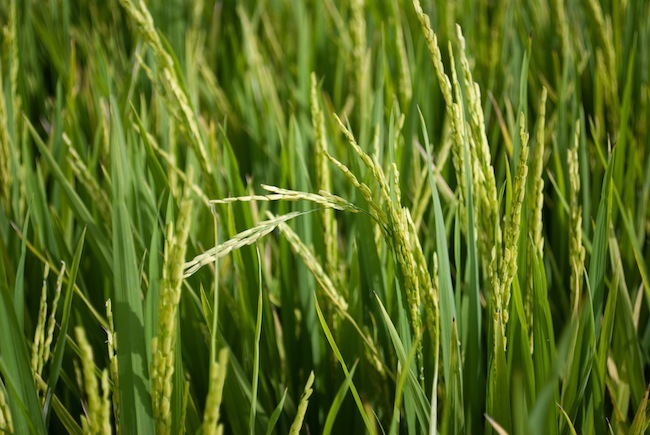 – Rice Bran Oil has a long and successful history in Japan as a base for soaps and skin creams. – Rice bran oil is purported to reverse the effect of aging by slowing the formation of facial wrinkles thanks to rice bran oil’s rich concentration of vitamin E and gamma-oryzanol. – The oryzanol in rice bran oil impedes the progress of melanin pigmentation and is effective in keeping skin smooth. – Rice bran oil reduces the harmful cholesterol (LDL) without reducing good cholesterol (HDL). What is a cold-pressed oil? Read a short but meaningful explanation on this link. How can this be anti-aging if it’s being used as a cleanser not a moisturiser. It’s just being washed down the drain? If you use it as a cleanser you don’t wash it down. You can also use it as a moisturizer. Does anyone know where to buy the cooking oil, rice bran oil? We have been using Rice Bran Oil for all of our cooking, frying, massage, essential oil blending and soapmaking for about four years and couldn’t possibly be more pleased. The best oil that we have foud is “Heart of The Dove Rice Bran Oil” produced in the “Heartland” of the good ol USA. Heart of The Dove RBO is available by the gallon on e-bay at the best price that we’ve found anywhere. Hi, Ive been buying 100% pure Rice bran Oil from Coles and Woolworthes supermarkets in Australia, sometimes Aldi sell it too. I cook with it and cleanse my face with it. I put it in a pump bottle in my shower, squirt some in my hand and start rubbing it in my face as soon as i get in the shower, the steam from the shower helps the oil to penetrate the pores. once finnished cleaning my self i simply was the oil off but not completely. Ive had problem skin for some time and this is the best and cheapest ive tried, great for removing make up too as its not drying. This stuff would also be awesome on stretch marks, Oh the list goes on, LOVE THIS STUFF..
Hi, Thanks for sharing so accurately your experience! I’m glad the rice oil works so well for you! I just bought RBO at Trader Joe’s for little over $5. I have been using on face 2 times a day for 3 days and it is wonderful. My face is very soft. I have used sesame oil and coconut oil in the past exclusively but this is fast stuff! Also trying to lower cholesterol. Tests show great results just in 60 days of use in cooking daily with it. Also available at Whole Foods.